That pesky scrap basket is full again and I am noticing a fair amount of green in the mix. Something is telling me that a holiday craft is in order. Be sure to start with pressed scraps. To be honest, I thought I was going to make these perfect little quilts but then I came to my senses and just free formed it! Start with pressed scraps. Any size is fine but straight edges are a must. Place two pieces right sides together and with sewing machine; straight stitch 1/4″ away from edge. 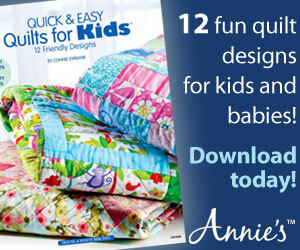 Press open and continue to build your mini scrap quilt. To make this process easy, I worked in blocks; then joined them together to create one larger piece. 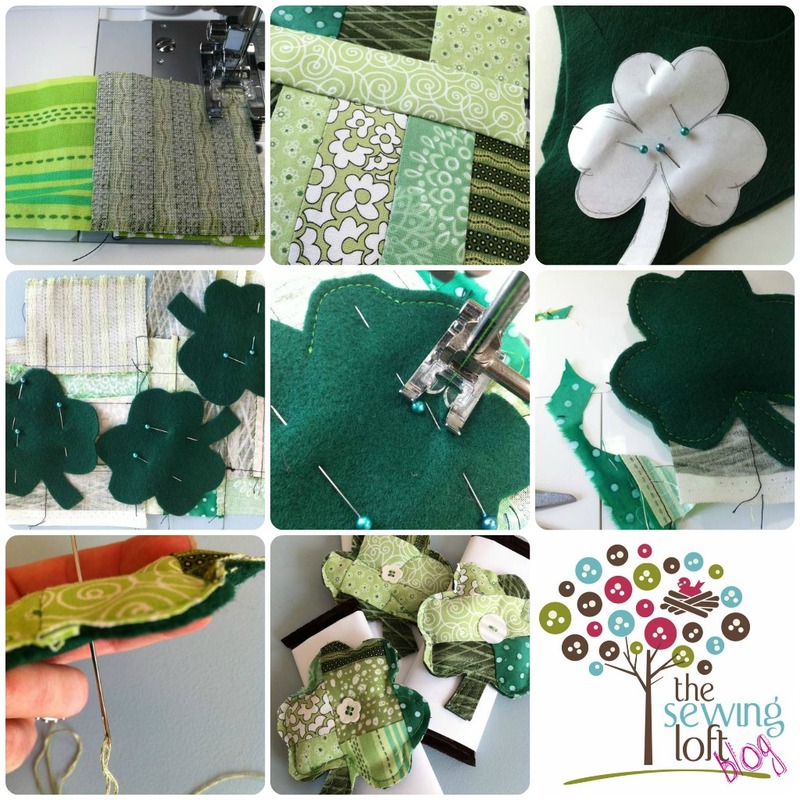 Draw a quick Shamrock on scrap paper, pin and cut shape from felt. Pin felt shape to wrong side of mini quilt; straight stitch all around with machine (or blanket stitch by hand) leaving a small section open; lightly stuff with poly fil; stitch closed. Cut around your outline for your finished shape. Additional stitching can be added to the Shamrock for dimension. Attach button in the center through all layers. For fun, I wrapped a candy bar in paper and tied the Shamrock on for a fun detail. These little cuties have a lunch date on 3/17. Now, if only I could find that pot of gold…. If so, I’m glad you stopped by and hope that something has inspired you to keep your needle moving! Don’t miss a single project and subscribe via email HERE! Bonus- free download with newsletter sign up. Another great way to connect with me is via Facebook, Pinterest, Twitter, or Follow my blog with Bloglovin. I’m looking forward to getting to know you and creating together! These are so cute, love the idea! Thanks! These are great Heather! Thanks for sharing!! This is just adorable! Thanks for sharing! How cute & how green (in every sense)! These can be changed into other Holiday motifs. Now you’ve started my mind whirling, Heather. These are adorable!! Thank you for sharing them at Sharing Saturday! Have a wonderful week! What a cute little idea – adding the button to the centre really makes them look great! they turned out super sweet! Love the shamrock. Love Ellen D too, she is so funny. I would love for you to share at Bacon Time’s Go Green linky and Group Giveaway if you have not already. These are just adorable! Will have to give it a try! Loved this. Posted a link my blog post today…check it out! These are so cute and adorable.. lovely!! Adorable! Thanks for sharing on So Creative, I featured this today! How fun is that?!!! Love it. Heather!!!! This is wonderful!! Your scrap pieces sure look great together!! These are fantastic! Definitely going to try them and will link back to this post! Thanks for such a wonderful idea! Thank you, so glad you enjoyed them. Send me photos. I would love to see your shamrocks! 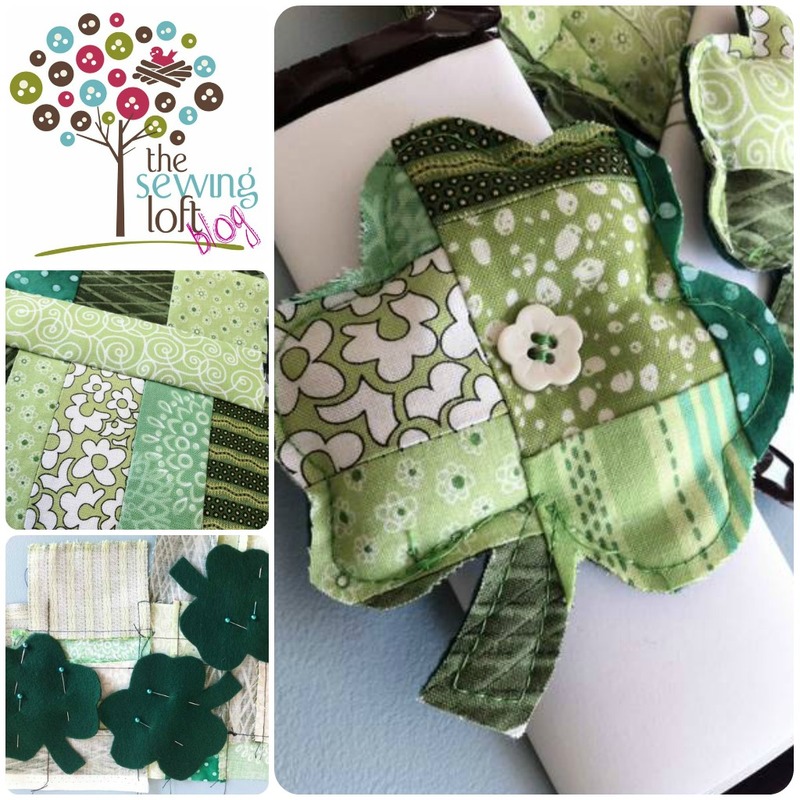 Awesome way to use scraps! Cute! So glad that you shared it at Things I’ve Done Thursday!! Adorable! Love it…..I have it featured over on my Facebook page today for all to see….thanks so much for sharing at CraftJunkieToo this week! So cute! Neat way to use the scraps! Thanks for sharing at the Rock ‘N Share! clever, pretty, and timely. thanks for sharing on becolorful’s motivated monday. this is so cute.. I just pinned and shared it on my FB page.. Thanks for sharing at Friday Fun Party.. So cute and creative! Thanks so much for sharing at Taking A Timeout Thursday! Just found your blog, so excited!! These are really cute!! Happy to be found Shannon! Hi Heather! Stopping by to let you know I featured these for St. Patrick’s Day! Cute project. But, when I saw the candy bar on the list of supplies, my mind went in a totally different direction. As I actually read the directions, I thought you were going to attach some sort of loop on the back (felt) before sewing to the mini-quilt in order to attach the candy bar. Kathleen a felt loop would be a good improvement. Thanks so much for sharing! Absolutely love your Scrappy Shamrocks!!! So many people mistake shamrocks for 4-leaf clover, but you got it bang on! Except, please don’t call it Patty’s Day!! No-one in Ireland would ever, ever call it that!! !